Hear readings from the ten collections chosen by the Forward judges from poetry published in the UK and the Republic of Ireland over the last 12 months. Between the readings, see the nation’s most coveted poetry prizes awarded live on stage. Michael Longley, Emily Berry, Sinéad Morrissey, Tara Bergin and Nuar Alsadir are up for the £10,000 Best Collection Award, while books by Ocean Vuong, Nick Makoha, Eric Langley, Maria Apichella and Richard Georges are in the running for Best First Collection. The Best Single Poem prize shortlist features Malika Booker, Mary Jean Chan, Harmony Holiday, Ishion Hutchinson and Ian Patterson. Now in their 26th year, the Forward Prizes for Poetry are dedicated to heralding fresh new voices as well as honouring famous names. This year’s judges are Andrew Marr, Ian Duhig, Mona Arshi, Sandeep Parmar and Chris Riddell. An anthology of the year’s best poetry is compiled from the poems entered for the Forward Prizes. The Forward Prizes for Poetry are the most coveted awards for poetry published in Britain and Ireland: they have played a key role in bringing contemporary poetry to the attention of the wider public for over a quarter of a century. They were set up in 1992 by philanthropist William Sieghart to celebrate excellence in poetry and increase its audience, and are awarded to published poets for work in print in the last year. The three prizes – £10,000 for Best Collection, £5,000 for Best First Collection and £1,000 for Best Single Poem – are unique in honouring both the work of established poets and the debuts of brilliant unknowns. 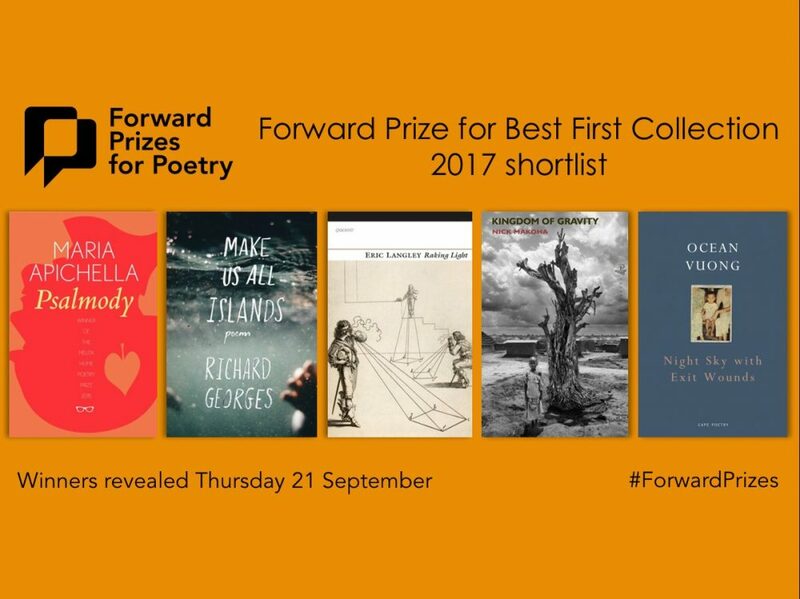 Past Forward Prizes winners include Claudia Rankine, Thom Gunn, Seamus Heaney, Alice Oswald, Ted Hughes, Carol Ann Duffy, and Kathleen Jamie. Read the Forward Prizes shortlists celebrated by The Bookseller, The Guardian, Irish Times, BBC, Foyles and Publishing Perspectives.